I have the shakes. Anxiety. Beads of sweat collect on my brow when I realise my ever-diminishing stash will be completely used up way too soon. Neither is going cold turkey. I have to find another source. Another pusher to fill my dependency. My need for the White Powder. At work they know my addiction... the White Powder I can't do without each and every day. Because I am the only one around who still uses REAL sugar in their coffee. All the other staff use Splenda or Sugar Twin. But not me. That crap makes me nauseous. I need the real thing. So whenever there are leftovers from rounds or meetings, the extra cups, coffee, creamers and stir sticks go to the Staff Room for everyone to share. It lands on my desk without me even asking....all for ME. And me alone. I hoard it in my desk drawer and dip into it whenever I need a fix. But dammit... during July and August, rounds are cancelled. Meetings are rare. And my stockpile dwindles to nothing. Frantically I search in vain for just a few more packs. Remember, you have a reserve at home you can bring into work to tide you over till September. When I was pregnant the mid-wife told me to use real sugar, not Splenda or anything else. It's fattening, but it's healthier than using artificial. I know Splenda is supposed to be from natural sugar, but come on..is it really? We have big containers of real sugar in our office. Big containers that get left open for the ants to crawl into. Deep breath. If you need, I can ship you some of our big containers. The Mr. Coffee man brings them. Oooh yeah I hate fake sugar too. Those chemicals are proven to be very unhealthy, esp for children. Good for you. I don't take any in my coffee, but I only drink my tea with real sugar. 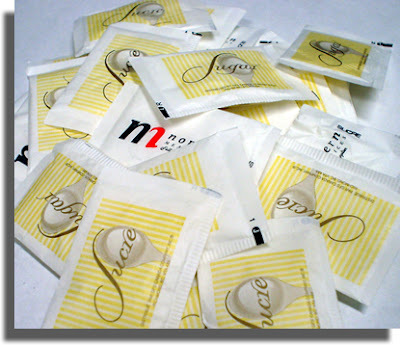 Artificial sweeteners should be banned from all staff meetings. Just swing by the local fast food restaurant, buy and Ice tea and stuff about 80 packets of sugar in your purse....if someone asks, tell them you like it reallly sweet. Jonny's Mommy: Mr. Coffee... yes! My new supplier is found! Sugar in "big containers"???? Whoo Hoo! DJ: Exactly. Nothing like natural stuff. My argument for butter over margarine as well. Irene: Hear! Hear! Yes. Sugar, or honey... take away that fake stuff. Hee Hee, thanks Toners (and welcome back!) I heard recently that diet soda is more harmful for you than regular; so you are correct! You've got an in for the raw sugar packets at Starbucks and haven't exploited that yet. Remarkable display of will power. I can take equal in my iced tea but don't ever try to give me coffee with a sugar substitute. Bleck! Ed: It's funny. BEFORE she started working there, I could take "extra" sugar without guilt... but now? It just seems, well, wrong. (And I wouldn't want to get her in trouble. They all know me there). Darn. Can't stand that fake stuff. I'm kinda scared of it, actually. I love sugar but not in my coffee. Not sure why. But my caffeine addiction is STRONG! Just found you. Love the look of your blog, so chic! I also hate fake everything: dressing, sugar, etc. I'd rather eat the good stuff in moderation. Good luck with the cold turkey! Ah, that's funny, but I feel your pain! I don't do the artificial sweetener thing. Nasty stuff. But I do have a serious sugar addiction. I know it's a real addiction, because if I don't have any at all, I'm fine, but one, tiny, taste, and I'm toast. Or should that be cake? I just found you too - via Kathy of the Junk Drawer. Looks very good so far! Hello. Stay strong, okay? Fake sugar is for the kind of people who can't pass a shop window without trying to see their own reflection. Fake sugar is for those people who have forgotten that life is meant to be fun. Fake sugar is for self-obsessed "my body is a temple" kind of people. They are a joyless, pasty-faced menace and they work tirelessly as enemies of the state, plotting to kill us all. Okay, that last bit was maybe a wee bit made up - but still. Plus, as somebody already said, the chemicals in these artificial sweeteners are almost certainly more harmful than anything to be found in pure sugar. So the next time somebody tells you that these things are better for one's health, just tip your head back and pour in the sugar, laughing, happy, rejuvenated and free. I don't use any sugar or sweeteners.. Here we buy 1 small bag of sugar in about a year.. However I get too much sugar from all the choccies etc I eat..
Janet: Me too. Ever since I got sick after drinking a diet drink. Drowsey Monkey: Ah, yes. Coffee. Probably the only craving stronger than sugar. Kash: Welcome! And thank you! You're right. Natural things in moderation. The only way to go. Then I shouldn't tell you that McDonalds puts...LIQUID sugar in their iced coffee? When I went to get more sugar since mine wasn't sweet enough, the girl asked "Oh, do you want some more liquid sugar in it?" I think that they can hide the crack easier in liquid sugar, hence why I need to get their iced coffee before every show. Love your new picture at the top, Maureen! I am an avid Tea drinker. I use only the real stuff. I also use real Mayo. I even have real boobies. Maybe that was TMI, but I am a big fan of REAL things. LOL! OhMommy: You kill me... "They're real, and they're spectacular". Har!! Nothing like the real thing... no matter what it is! Ah, yes. The White Stuff. I don't use sugar in my coffee or tea, but I must, MUST have it on my oatmeal. And then it must be brown sugar. Have you ever had an English muffin with butter and brown sugar? That fake stuff is bad for ya. It's possible I've seen this white powder at the grocery store. Now I can't be positive, but maybe. Aspartame has been shown in recent studies to be more addictive than caffiene! Who knew? I think natural is he way to go... that way we KNOW what will happen when we consume it! :-) Moderation is the key, as has been stated by an earlier commenter. Ha ha! I don't use sugar in my beverages I just consume it in mass quantities in the form of chocolate, ice cream, donuts or whatever other confection I can get my grubby little hands on! I know your addiction! And I know when it's not real sugar too! I'm a real sugar gal, too but in my coffee, I drink it black and with a fork as God intended. PS. Have it be known that Splenda is the devil: real sugar but cooked in phosgene gas and chlorine. MMM, I can feel the cancer growing. Momo Fali: Ah yes. There are “dealers” out there if you know where to look. Phoenix5: I know! It’s the same with margarine. Can’t stand that stuff either. Heather: Ah yes, the “hidden” sugar… it’s the best. Feeds my addiction without the obvious guilt trip. (at least for me). Bee: “with a fork as God intended” Har!!! And I shall have to show my “Splenda” daughter that little tidbit… she’ll revert back to the White Powder at last!